The Grand Geyser, the largest predictable geyser in Yellowstone, can spout boiling water over 150 feet in the air. Yellowstone National Park  is a United States National Park and a UNESCO World Heritage Site. It was the world's first national park, set aside in 1872 to preserve the vast number of geysers, hot springs, and other thermal areas, as well as to protect the incredible wildlife and rugged beauty of the area. The park contains 3,472 square miles (8,987 km2), mostly within the northwest corner of Wyoming, but with portions extending into the states of Idaho and Montana. It received 3,000,000 visitors in 2015. Long before any recorded human history in Yellowstone, a massive volcanic eruption spewed an immense volume of ash that covered all of the western U.S., much of the Midwest, northern Mexico and some areas of the eastern Pacific Coast. The eruption may have been as much as one thousand times more powerful than the 1980 eruption of Mt. St. Helens, and it left a caldera approximately 34 by 45 miles (55 by 72 km). The Yellowstone super volcano is believed to erupt every 600,000 to 900,000 years with the last event occurring 640,000 years ago. Its eruptions are among the largest known to have ever occurred on Earth, producing drastic climate change in the aftermath. Although it is commonly assumed that the park was named for the yellow rocks seen in the Grand Canyon of the Yellowstone, the park's name comes from the Yellowstone River that flows through it, which is in turn named after sandstone bluffs found farther down its course in eastern Montana. On March 1,1872, Yellowstone became the first National Park reserve declared anywhere in the world, by President Ulysses S. Grant. In 1978 it was designated a World Heritage Site by UNESCO. With half of the earth's geothermal features, Yellowstone holds the planet's most diverse and intact collection of geysers, hot springs, mudpots, and fumaroles. Its more than 300 geysers make up two thirds of all those found on earth. Combine this with more than 10,000 thermal features comprised of brilliantly colored hot springs, bubbling mudpots, and steaming fumaroles, and you have a place like no other. Yellowstone's hydrothermal features would not exist without the underlying magma body that releases tremendous heat. They also depend on sources of water, such as from the mountains surrounding the Yellowstone Plateau. There, snow and rain slowly percolate through layers of permeable rock riddled with cracks. Some of this cold water meets hot brine directly heated by the shallow magma body. The water's temperature rises well above the boiling point but the water remains in a liquid state due to the great pressure and weight of the overlying water. The result is superheated water with temperatures exceeding 400 ° F.
The superheated water is less dense than the colder, heavier water sinking around it. This creates convection currents that allow the lighter, more buoyant, superheated water to begin its journey back to the surface following the cracks and weak areas through rhyolitic lava flows. This upward path is the natural "plumbing" system of the park's hydrothermal features. Once it reaches the surface, the various colors of the pools are due to different types of bacteria growing in different temperatures. Yellowstone is home to the largest concentration of mammals in the lower 48 states. Sixty-seven different mammals live here, including grizzly bears and black bears. Gray wolves were restored in 1995 and more than 100 live in the park now. Wolverine and lynx, which require large expanses of undisturbed habitat, are also found in the Yellowstone ecosystem. Seven native ungulate species - elk, mule deer, bison, moose, bighorn sheep, pronghorn, and white - tailed deer live here. Non-native mountain goats have colonized northern portions of the park and numerous small mammals are found throughout the park. Records of bird sightings have been kept in Yellowstone since its establishment in 1872; these records document 330 species of birds to date, of which approximately 148 species are known to nest in the park. The variation in elevation and broad array of habitat types found within the park contributes to the region's relatively high diversity. The weather in Yellowstone National Park can change very rapidly from sunny and warm to cold and rainy, so it's important to bring along extra layers of clothing which can be used as needed. Summer: Daytime temperatures are often in the 70s (25°C) and occasionally in the 80s (30°C) in lower elevations. Nights are usually cool and temperatures may drop below freezing at higher elevations. Thunderstorms are common in the afternoons. Winter: Temperatures often range from zero to 20°F(-20°C to -5°C) throughout the day. Sub-zero temperatures over-night are common. The record low temperature is -66F (-54°C). Snowfall is highly variable. While the average is 150 inches per year, it is not uncommon for higher elevations to get twice that amount. Spring & Fall: Daytime temperatures range from the 30s to the 60s (0 to 20°C) with overnight lows in the teens to single digits (-5 to -20°C). Snow is common in the Spring and Fall with regular accumulations of 12" in a 24 hour period. At any time of year, be prepared for sudden changes. Unpredictability, more than anything else, characterizes Yellowstone’s weather. Always be equipped with a wide range of clothing options. Be sure to bring a warm jacket and rain gear even in the summer. 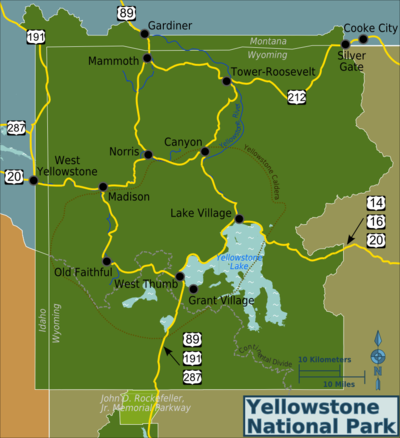 Yellowstone National Park area map. The closest airport to Yellowstone is West Yellowstone (Montana) (IATA: WYS), just 1 mile north of the town of West Yellowstone (and 2 miles north of the west entrance to the park) on U.S. Hwy. 191. The airport has commercial air service seasonally (Jun- end of Sep) only, on Delta Connection/SkyWest, connecting through Salt Lake City. Yellowstone is located far from any major airports. 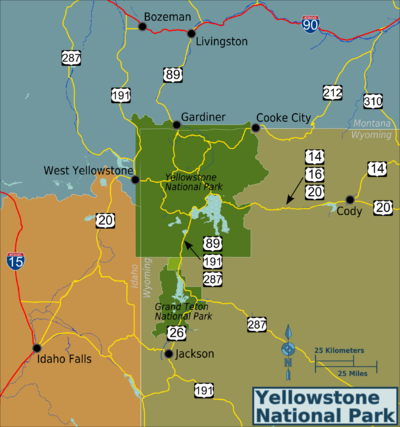 The principal airport serving Yellowstone is the Jackson Hole Airport (IATA: JAC)  located within Grand Teton National Park. United and Delta serve Jackson Hole year-round, from Denver and Salt Lake City respectively. American and Frontier provide service on a seasonal basis. The airport is 56 miles from the southern entrance of Yellowstone. Small airports with limited/seasonal commercial service can be found in the towns below. Many fly into Salt Lake City and drive for ~5 hours to Yellowstone. The park has 5 entrances. The nearest cities to each entrance are given. North - Accessed from Gardiner (Montana) via US Route 89 (56 mi, 90 km from Livingston). This entrance is open all year and leads to the park headquarters at Mammoth Hot Springs, 5 miles (8 km) inside the park boundary. The iconic Roosevelt Arch is located at this entrance. Northeast - Accessed from Silver Gate and Cooke City via US Route 212 (Beartooth Highway). The entrance and road to Cooke City are open all year, but Route 212 past Cooke City is closed in winter (mid-October to late May). East - Accessed from Cody (53 mi, 85 km) via US Route 14/16/20. This entrance is closed in winter (early November to early May). South - Accessed from Grand Teton National Park via US Route 89/191/287. This entrance is closed in winter (early November to mid-May). West - Accessed from West Yellowstone via US Route 20/191/287 (60 mi, 97 km from Ashton (Idaho). This entrance is closed in winter (early November to late April). All vehicles and individuals entering the park must pay an entrance fee that is valid for seven days. The entrance fee provides entry to both Grand Teton and Yellowstone National Parks. Fees are $30 for non-commercial vehicles (weekly pass), $12 for hikers and cyclists, and $20 for motorcycles and snowmobiles. One year passes are available as an alternative to the seven day fee. The Park Annual Pass is $60 and provides entrance to Yellowstone and Grand Teton National Parks. The Interagency Annual Pass is $80 and provides entrance to most federal recreation sites across the country including Yellowstone and Grand Teton National Parks. A senior pass (62+) for $10 is valid for life and provides free admission to any National Park. No vehicle fee. Most visitors use private vehicles to get around inside Yellowstone National Park. There is no public transportation available within the park, although various concessionaires offer bus tours, usually departing from West Yelowstone, MT. Roads can become very crowded whenever people stop to view wildlife; use pullouts, and be respectful of other motorists to help avoid bear-jams. When snow falls roads may be closed. During winter months (November-April) most park roads are closed. The only road open year-round is from the north entrance to the northeast entrance (because otherwise Cooke City, Montana would be completely cut off). During the winter access is available via snow coach and snowmobile. The Snow Lodge at Old Faithful is open, and can only be reached by snow vehicle. Xanterra Resorts  provides bus tours within the park during the summer season. The Lower Loop Tour departs from locations in the southern part of the Park only. The Upper Loop Tour departs from Lake Hotel, Fishing Bridge RV Park, and Canyon Lodge to tour the northern section of the park only. The Grand Loop Tour departs from Gardiner and Mammoth Hot Springs Hotel to tour the entire park in one day. During the winter season snowcoach tours are provided from various locations. Call (307) 344-7311 for information or reservations. In addition, during the summer season, commercial businesses offer tours originating from many area towns and cities. During the winter season, some businesses provide snowcoach tours for most park roads or bus transportation on the Mammoth Hot Springs to Cooke City road. Cycling in the park can be a very rewarding experience, but due to the great distances in the park some additional planning is necessary to ensure that lodging is available each night. The park reserves a number of campsites for cyclists, but during the busy summer season it is probably best to reserve sites in advance wherever possible. 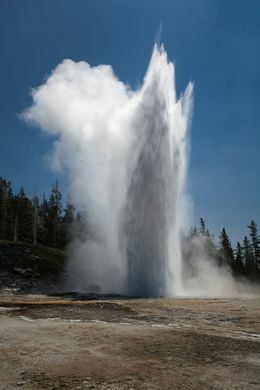 Clepsydra geyser at play, Lower Geyser basin. Yellowstone is world-famous for its natural heritage and beauty - and for the fact that it holds half the world's geothermal features, with more than 10,000 examples. Travelers to Yellowstone can view more than 300 geysers (such as "Old Faithful"), pools of boiling mud, and an amazing assemblage of wildlife, such as grizzly bears, wolves, bison and elk, all while standing on the surface of the Earth's largest known "super-volcano". The park can be sub-divided into approximately eight major areas, which are organized below as they would be encountered by someone traveling the park in a clockwise direction, starting from the east. These two villages are located on the western side of Yellowstone Lake and offer boating and fishing as well as some interesting thermal features, including the "Fishing Cone", a hot springs that bubbles out directly into the lake. The area's name comes from the fact that with a little imagination, Yellowstone Lake looks like a left hand reaching southward, and this area would be the "thumb" of that hand. Old Faithful is the image people think of when they think of Yellowstone, and the geyser erupts semi-regularly (check the visitor center for estimated eruption times). This area is also home to the iconic and historic Old Faithful Inn, as well as a vast number of geysers and hot springs that are easily accessible via boardwalks. If you like crowds you'll love Old Faithful. Huge parking lots, tour buses, the two-lane park road becomes four lanes with an interchange and overpass. Crowded even in off season. Cell phone service, several places to eat, etc. A "zoo". Madison is located midway between Old Faithful and the Norris Geyser basin and offers an array of thermal features. Located south of Mammoth, the Norris area is a home to a vast array of thermal features, including Steamboat Geyser, the world's largest. The area was named after Philetus W. Norris, the second superintendent of Yellowstone, who provided the first detailed information about the thermal features. The calcite terraces at Mammoth Hot Springs. These springs flourished with water until the late 1970s, but are currently dry. The Tower area is one of the park's more rugged regions and is a good place for spotting wildlife. The Lamar Valley, located east of Tower, is home to one of the park's more accessible wolf packs as well as elk, bighorn, and other large animals. Artist's Point, the classic, iconic overlook of Lower Yellowstone Falls. The Canyon village is named after the Grand Canyon of the Yellowstone and offers access to this impressive natural landscape. Recreational opportunities include hiking and wildlife viewing - the Hayden Valley area is probably the best place in the park for seeing bison. Many visitors believe they can visit all 2.2 million acres of Yellowstone in 1-2 days - all the while staying within sight of their car or tour bus. To truly appreciate this vast park, get off the park roads and paved tourist paths. The summer of 1988 quite literally transformed the park and the national park system, as thirty-six percent of Yellowstone was affected by a massive, months-long wildfire that consumed 793,880 acres (3,213 km2) and caused the park to be completely shut down on September 8. The enormous conflagration cost $120 million to fight and at one point seriously threatened both the Old Faithful Inn and the historic buildings in Mammoth. The blaze was so powerful that it actually jumped across a river canyon, and media reports at the time often gave the erroneous impression that the park had been completely destroyed. Since the fire, the park management plan has changed. A contributing factor to the severity of the 1988 fire was the buildup of fuel from years of fire suppression, so today natural wildfires are allowed to burn unless they are deemed a danger. Most importantly, the fires of 1988 demonstrated the importance of fire to the natural ecosystem in restoring soil nutrients, dispersing seeds of fire-resistant plants such as lodgepole pines, and creating grazing land for animals like elk and bison. There are a huge number of day hikes available in the park, and since many visitors travel only to the most popular geyser basins these trails can provide an opportunity to see the park in a more natural setting. A bison ambles along Norris to Canyon Road. Despite their docile appearance, bison are temperamental and can move extremely fast.They should be viewed from a safe distance through binoculars or telephoto lenses. 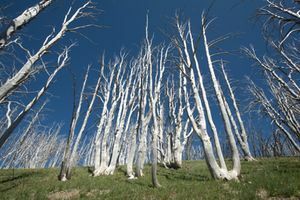 Dead trees near the summit of Mt. Washburn. These trees are the victims of a massive forest fire in 1988 that burned through over 30% of the forest running through the park. Every major village within the park offers food, camping supplies, and souvenirs for sale, although these stores all close during the winter months. Vintage sign at Mammoth Hot Springs: There are a variety of restaurant venues scattered throughout the park. Cocktails can be purchased in the lodge restaurants, and lighter beverages can be obtained at the snack bars. A small cauldron bubbles in the Upper Geyser Basin across from Old Faithful Inn. While there are an abundance of hotels and campgrounds within the park, they fill quickly in the summer so visitors may also want to consider lodging options in the gateway towns of West Yellowstone and Gardiner. Lodging in the park fills quickly and should be booked in advance. Cancellations are common, so if a particular lodging option is unavailable it is a good idea to re-check frequently to see if it becomes available. Reservations for all lodges and cabins in the park can be made through Xanterra Parks & Resorts  or by calling (307) 344-7311. All park accommodations are non-smoking and, reflecting the natural surroundings of Yellowstone, televisions, radios, air conditioning, and Internet hook-ups are not available. 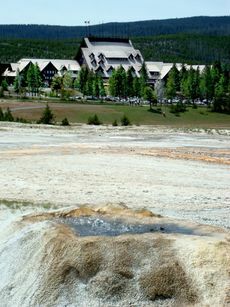 During the winter the only lodging within the park is the Old Faithful Snow Lodge and the Mammoth Hotel. Lamar Valley Cabins 1-307-413-1990 Two beautifully furnished cabins 1/2 mile from the Northeast Gate of Yellowstone. If you were asked to imagine a quintessential mountain cabin setting, this would be it. Towering mountain views from the front and back of cabins. Upscale furnishings and modern kitchens means no roughing it. Scope mountain goats while grilling your dinner on the deck. Situated in the tiny western town of Silver Gate. Best part of all - no fighting crowds or tourist traps! Address: 97 West Hwy 212, Silver Gate, MT " [email protected] http://lamarvalleycabin.com Prices range from $150-$265/night. Xanterra Parks & Resorts  operates campgrounds at Bridge Bay, Canyon, Fishing Bridge, Grant Village, and Madison. Same-day reservations can be made by calling: 307-344-7901. Future reservations can be made by calling: 307-344-7311 or by writing: Yellowstone National Park Lodges, PO Box 165, Yellowstone National Park, WY 82190. Big Wild Adventures offers guided backpacking trips in Yellowstone . Reservations should be made well in advance and/or campsites should be secured as early in the day as possible. Campgrounds may fill by early morning, especially during peak season (early July - late August). Recreational vehicles over 30 ft should make reservations since there is a limited number of RV sites available in Yellowstone. Large RV sites are located at Flag Ranch, Fishing Bridge RV Park and West Yellowstone. Indian Creek, Lewis Lake, Mammoth, Norris, Pebble Creek, Slough Creek, and Tower Fall are operated by the National Park Service and do not accept reservations; all sites are first-come, first-served. Permits are required for all backcountry camping, and quotas are placed on the number of people that may use an area at a given time. The maximum stay per backcountry campsite varies from 1 to 3 nights per trip. Campfires are permitted only in established fire pits, and wood fires are not allowed in some backcountry campsites. A food storage pole is provided at most designated campsites so that food and attractants may be secured from bears. Neither hunting nor firearms are allowed in Yellowstone's backcountry. Permits may be obtained only in person and no more than 48 hours in advance of your trip, although backcountry sites may be reserved through the mail well in advance for a non-refundable $20 reservation fee. To reserve a site, download the reservation form from the Backcountry Trip Planner , call (307) 344-2160, or by writing: Backcountry Office, PO Box 168, Yellowstone National Park, WY 82190. In addition, permits may sometimes be obtained from rangers on duty at the East Entrance and Bridge Bay Ranger Station. However, these rangers have other duties and may not be available to provide assistance at all times. During the spring, fall, and winter seasons, ranger stations and visitor centers do not have set hours. To obtain a Backcountry Use Permit during these seasons, check the office hours posted at the nearest ranger station or visitor center. Though many of the animals in the park are used to seeing humans, the wildlife is nonetheless wild and should not be fed or disturbed. Stay at least 100 m away from bears and 25 m from all other wild animals! No matter how docile they may look, bison, elk, moose, bears, and nearly all large animals can attack, and every year dozens of visitors are injured because they didn't keep a proper distance. These animals are large, wild, and potentially dangerous, so give them their space. 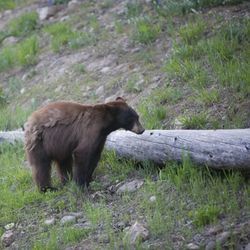 In addition, be aware that odors attract bears and other wildlife, so avoid carrying or cooking odorous foods and keep a clean camp; do not cook or store food in your tent. All food, garbage, or other odorous items used for preparing or cooking food must be secured from bears. Treat all odorous products such as soap, deodorant, or other toiletries in the same manner as food. Do not leave packs containing food unattended, even for a few minutes. Animals which obtain human food often become aggressive and dependent on human foods, and many can suffer ill health or death from eating a non-native diet. Always stay on boardwalks in thermal areas. Scalding water lies under thin, breakable crusts; pools are near or above boiling temperatures. Every year visitors traveling off trail are seriously burned, and people have died from the scalding water. Park rangers can also issue $125 fines for being out of bounds. Note though, it's common to get sprayed with fine mist from the geysers. You don't need to worry about being burned, as the water has traveled sufficient distance to cool down, provided you're within the designated areas. No swimming or bathing is allowed in thermal pools. The weather can change rapidly and with little warning. A sunny, warm day can quickly become a cold, rainy or even snowy experience. Hypothermia can be a concern. Be prepared for a variety of weather conditions by bringing along appropriate clothing. Lightning can and does injure and kill people in the park, so watch the sky and take shelter in a building if you hear thunder. When camping, either filter, boil, or otherwise purify drinking water. Waters may be polluted by animal and/or human wastes, and intestinal infections from drinking untreated water are increasingly common. Finally, with so many people visiting the park each year petty crimes are something to be vigilant against. Lock your car doors and exercise sensible precautions with valuables. Grand Teton National Park. Yellowstone's southern neighbor is famous for its dramatic mountain vistas and its alpine lakes. Admission to Grand Teton is included in the Yellowstone price. Note, however, that the road connecting the two parks is closed during winter (early November to mid-May). West Yellowstone. This town is most notable as a gateway to the park, with all the motels, services, and kitsch that park visitors require. West Yellowstone is the most convenient non-park lodging option for those planning to visit the Old Faithful area. Virginia City (MT). Historical gold mining town of the old west. About 90 mins. from West Yellowstone, and halfway to either Butte or Bozeman, Montana. In the town of Ennis, be sure to turn right at Main St. onto Montana Hwy 287, and stop following the US highway of the same number. Gardiner. Located just north of the park, Gardiner is another border town that provides lodging and service options. It is the most convenient non-park option for those wanting to be near the Mammoth area of Yellowstone. Cody. Located about fifty miles from the park's east entrance, this town offers a Wild West atmosphere in addition to lodging and service options. The Cody rodeo runs during the summer and the Buffalo Bill museum provides a good collection of old West artifacts. This page was last edited on 19 April 2019, at 16:30.